A teen is to face trial accused of a series of offences of grabbing females by the buttocks. Alexander Ross (19) is said to have sexually assaulted his first alleged victim by seizing hold of her buttocks in the Thistles Shopping Centre in Stirling on February 23 this year. He is then accused of sexually assaulting a schoolgirl, aged 15, in Thornhill Road, Falkirk, on June 21; another woman on the July 13 in Tesco in Falkirk’s Central Retail Park; and yet another woman in Wallace Street, Falkirk, two days later on July 15 – all by seizing hold of their buttocks. 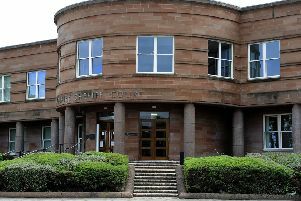 At Stirling Sheriff Court today, Ross, of Towers Court, Falkirk, pleaded not guilty to four charges of sexual assault. Defence solicitor Ken Dalling said he was hoping to get a report from a forensic psychologist into Ross’s state of mind. Sheriff Wyllie Robertson continued the case for trial on December 13th. He also ordered Ross, who is on bail, to appear at a preliminary hearing on December 4.